Dog walking in the underwater threadmill. 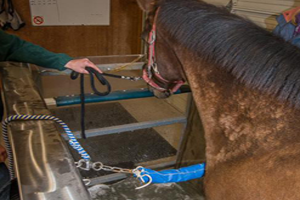 Ferno Aquapaws and AquaPacer Underwater Treadmills provide aquatic therapy for the rehabilitation and conditioning for dogs and horses. The Aquapaws for dogs and the Aquapacer for horses use the natural buoyancy of water to provide a low-impact workout. 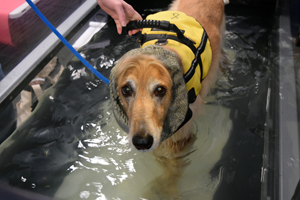 Benefits of underwater treadmill therapy include: reduction of weight bearing to 40-60%, decreased impact on joints, pain reduction, increased blood flow and reduction of swelling, soft tissue mobilization. The underwater treadmills help to build up muscle and endurance faster than swimming since the animal is partially weight bearing and this allows for shortened rehabilitation times and quicker return to regular activities. The underwater treadmill workouts can be tailored to each animal’s needs by adjusting the water level, speed of the belt and workout time. Request refills of your pet's prescriptions to be shipped directly to you or pick up at the clinic. Download, print and fill out client and patient forms to bring to your first appointment. We are now accepting NEW Chiropractic and Acupuncture patients. Please contact us for more information.